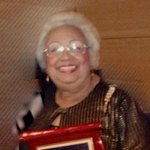 Maria Luna has been called “a political legend in Washington Heights” by the Daily News (May 19, 2011). The first person of Dominican extraction to serve as a Democratic district leader, Maria has been politically involved in Upper Manhattan since 1983. She has also served on Community Board # 12 for over 27 years, including as it’s Chairperson. A retired manager of the accounting department of the American Museum of Natural History, Maria has served on countless statewide and nationwide committees, as well as on the Board of a number of not-for-profit organizations in Upper Manhattan.